Home >> Analysis and Features >> Analysis: Air India sells Boeing 777-200LRs to Etihad. Aircraft ill-suited for its operations. Two days ago, when gulf major, Etihad Airways, announced its intention to fly between Abu Dhabi and Los Angeles, we at Bangalore Aviation were the first to indicate that Etihad’s announcement was a pre-cursor to its purchase of Boeing 777-200LRs from Air India. 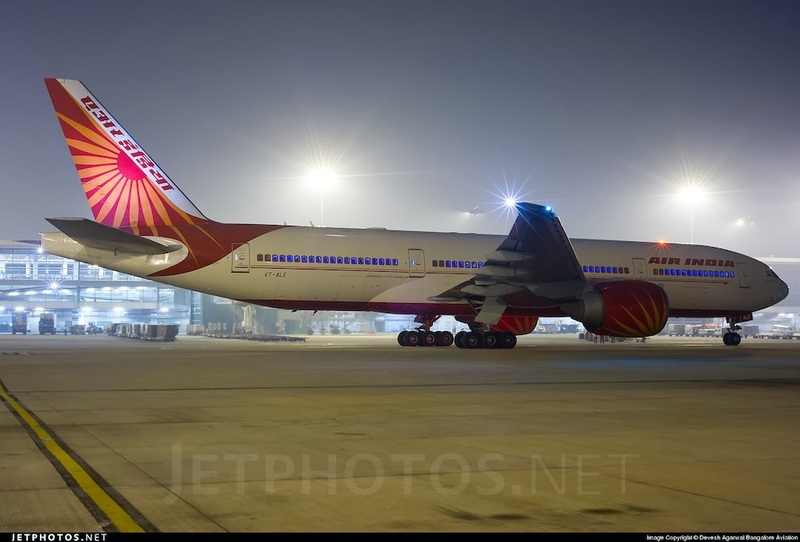 Yesterday, it was confirmed that Air India will indeed sell five of its eight Boeing 777-200LRs to the gulf carrier. the aircraft will be delivered to Etihad Airways from the beginning of 2014 and each will be re-fitted in a three class cabin configuration consistent with similar aircraft in the Etihad Airways fleet. It is expected the first aircraft will enter service in April 2014. Etihad currently does not have any 777-200LRs in its fleet. On its 777-300ERs, Eithad follows the lead of its fellow UAE carrier Emirates and has a bone crunching ten abreast 17 inch wide economy class seating. For the LR, Etihad has announced a configuration of eight first class suites, 40 business class flat beds, and 189 economy class seats. This is similar to Air India’s current configuration of 8/35/195 which features a more comfortable nine abreast 18.5 inch wide economy class seating. Emirates which has the narrow ten abreast seating even in its LRs has 42 business class and 216 economy class seats. So it appears that Etihad will continue with the nine abreast seating. Etihad is expected to pay an estimated sum of $500 million. For aircraft that are about six years old, while this is a reasonable price, for Air India it is a distress sale. We should thank a former civil aviation minister, for whose failed flights of fancy, we tax-payers, are ultimately paying for.Despite the haircut, this is a beneficial development for Air India as it will help the carrier reduce about $60 million a year in expenses, but this is a drop in the veritable ocean of losses for the mismanaged carrier whose debt now tops a whopping $6.7 billion, well ahead of the entire health department’s budget of the nation for this year. For reasons best known only to it, Air India will still retain three 777-200LR aircraft. One is hard pressed to understand why, since Air India had these five LRs on the tender list for a long long time. Most likely, to operate Newark, which is essentially the only long haul flight in Air India’s system that is profitable. Air India also operates LRs to Tokyo, Osaka, Seoul, and Hong Kong, which is akin to taking our money and setting it on fire. The 777-200LR is a niche aircraft, called WorldLiner because of its ultra long haul (ULH) mission profile. It can fly close to 20 hours non-stop. However, to fly so long, the LR needs to carry a lot of fuel which takes up the weight of fare carrying passengers. The Air India LRs have similar engines, GE90-110B, as bigger brother, the 777-300ER which uses GE90-115B, and hence similar fuel burn characteristics, yet the LR is about one-thirds smaller than its bigger brother. Additionally, the LR sacrifices weight and cargo space for the additional fuel tanks required to carry that additional fuel. The LR carries only around 235 passengers which is only 58% i.e. almost half, of the 400 carried in the ER. All these factors force an airline to earn more per passenger-kilometre flown. To achieve this income, the plane has to be virtually filled to capacity with high fare paying passengers. Part of the higher fare comes from the “front of the bus” i.e. premium class passengers. Unfortunately with years of sloth, indifferent service, and unreliable schedules, Air India has completely lost the trust of the corporate flyer who pay for these premium seats. For the shorter missions like Delhi Hong Kong Japan or Korea, the additional fuel tanks, become dead-weight, further burdening the carrier, which requires the airline to fill to at least 95% of the seats just to break-even. An impossibility for an inefficient state carrier like Air India. So one should ask why is the carrier burning money operating these routes? and what are the solutions? As to why the carrier operating these routes with a clearly mismatched aircraft. From within Air India the answer is likely to be, “We need to operate this route and we do not have any other wide body medium capacity aircraft”. So why not lease an A330 or a Boeing 777-200 which will provide better economics? Here the ugly head of corruption rears itself. The carrier’s record is poor to say the least. Another solution could be with Jet Airways, India’s other wide body carrier. Jet has its fleet of A330s parked and under-utilised. Some are due to be leased to Etihad. Air India can outsource these routes to Jet on a wet lease? May be Jet, with its Etihad partnership, is not too keen at this moment, but more likely, Jet knows that such a proposal will not be able to overcome the farce of sympathy that will be created by the politicians? Then of course is the much hyped Boeing 787 Dreamliner. However, as Boeing boss Dinesh Keskar told us “the 787 is not the airplane to go to Dubai and back”, the 787 delivers fuel savings only when flying medium to long distances. Not short regional routes like New Delhi Dubai or New Delhi Hong Kong or onwards from Hong Kong to Korea or Japan. What are your thoughts on the 200LR situation? Share them with a comment.